1In spring 1873, two years after France’s devastating defeat in the Franco-Prussian war, Georges Hartmann hired Edouard Colonne to conduct eight “Concerts Nationals”1. With them, he aimed to promote French music, especially that which he published2. The concerts attracted a large, enthusiastic crowd, but lost money. A year later Colonne founded his own orchestra, subsequently known as the Concerts Colonne. Their challenge was to attract a mass public for serious orchestral music, successfully compete with other local orchestras, and make music integral to city life. 2I will examine how Colonne built this public and helped his orchestra grow into one of the most important of the late nineteenth century. With financial strength been understood as the key to an orchestra’s long-term success3, my study focuses on what can be learned from the ticket sales for each concert and from annual changes in the organisation’s revenues and expenses, information gleaned from the organisation’s extensive archives. Comparing this with a close study of their repertoire, we see how Colonne tracked and responded to his listeners’ tastes. Continually re-evaluating the balance between old and new works, vocal and instrumental music, foreign and French composers, entertainment and education, he forged a succession of strategies – some borrowed from predecessors, some utterly new–that insured their growth and survival. These strategies reveal not only the changing nature of public taste, but also the limits of Colonne’s willingness to cater to that taste and the various musical or political agendas that sometimes took precedence. A study of the relationship between audience reception and orchestra production before 1900, the present suggests that market considerations changed continuously during this period. Colonne’s flexibility in dealing with them was essential to his success. 3In 1874, with an initial investment of 50,000 francs paying dividends, Colonne formed the Société Civile Financière des Concerts du Châtelet. Ambroise Thomas, the director of the conservatory, became their honorary president. Every Sunday afternoon beginning in October, for sixteen weeks in 1874-75, twenty weeks in 1875-76, and twenty-four weeks per season thereafter, they offered two series of every-other-week concerts. (This allowed the public to subscribe to their concerts and to those by one of their competitors). Dedicated to making classical and modern music “popular”, these concerts aimed to serve the broadest range of listeners at the most reasonable prices. Subscribers paid from 40 to 50 francs, while individual seats ranged from 4 or 5 francs to 75 centimes. For concerts with extra soloists and choruses, especially the ever-popular Concert Spiritual each Good Friday evening, ticket prices sometimes rose to between 8 and 1.25 francs. In 1878, they became the Association Artistique des Concerts Colonne. 4Unlike for other orchestras of the time, such as those in Boston and New York, all decisions concerning Colonne’s orchestra were made by nine or ten orchestra members elected in a general assembly by secret ballot. The conductor had to win two thirds of the vote. This committee, which met weekly, oversaw finances and competitions for new players, decided on wages, selected new works for readings or concert performances, tracked audience reception, and chose programmes except in rare cases when all players voted. 5After two years probation, players were full members of the society (sociétaires). They were not allowed to perform for any other organisation. “Taking elsewhere the expertise they might have learned by playing in the Concerts Colonne” was considered a “form of stealing”, and four absences in a year constituted grounds for dismissal. Normally they rehearsed three times a week, on Tuesday, Thursday, and Saturday mornings. Their wages, determined at the end of the season depending on the organisation’s profits, were calculated by multiplying the number of attendances at rehearsals and concerts (présences) times a variable wage base (unité de jeton). Colonne received three times this unité for each rehearsal and six times for each concert, the assistant conductor three times the unité for each concert, ordinary members double for each concert, and trainees (stagiaires), eight tenths for rehearsals and 1.6 for concerts. The last column of Table 1 lists the annual amount that was divided among orchestra members, and the wage base. In 1878-79, the wage base was two francs; however, with the unprecedented successes of the 1883-84 season, it was raised to four francs. Throughout the 1880s, it fluctuated between 4 and 4.50, in the 1890s between 4 and 4.75, and in 1902-03 went up to 5 francs. This kind of agreement insured that performers sought not only the highest quality in their concerts, but also a relationship with the public that would bring financial security. 6This democratic self-organisation affected their programming decisions as well. Their concerts, as for orchestras of other European capitals, presented five works of different genres – a classical symphony, an overture or programme music, a concerto, a vocal work, and another genre such as a serenade, march, or ballet music4. The identical typefaces on the early programmes implied no hierarchy among them. But unlike most of their peers, especially the prestigious Société des Concerts du Conservatoire, Colonne included, right from the beginning, a wide range of premieres of new works and little-known music from the past. These were chosen by the conseil d’administration for readings or concert performances – often composers assisted with rehearsals of their new works5. Music by women composers, such as Louise Farrenc and the Vicomtesse de Grandval, was included as early as February 1875. Between 1873 and 1901, the Concerts Colonne played music by more living composers than dead ones, by a ratio of three to two, and as many French as foreigners – part of the national agenda of regeneration. 7To begin building an audience, Colonne sold honorary memberships with admission to dress rehearsals on Saturday mornings, a practice begun in the late eighteenth century6. At first these cost 40 francs In 1893, they were raised to 50 francs (60 fr for the better seats). Every year these revenues were significantly higher than subscription sales (see Table 1). Because the names were printed in the programmes for over ten years, we can study the composition of this group. In the 1870s there were lots of composers, perhaps because they hoped Colonne would perform their works7. Many of the original female members were also musicians or music patrons8. For the first decade, twice as many honorary members were male (37 women vs. 72 men the first season, then 58 to 144 in November 1874, 75 to 128 in December, 83 to 162 in February 1875, and 131 to 234 in December 1876). With the growth from 109 members in 1874 to 365 in 1876 and to 905 in 1885 came a number of changes. Increasingly one finds multiple names from the same family. Also, by 1884-85, the number of women had grown to almost equal that of men (364 vs. 388), and in October 1885, there were 470 women vs. 435 men. When they filled the hall to three quarters capacity, dress rehearsals became major public events reviewed by the press. 1. Concerts Colonne programme of 10 January 1892, published by the popular weekly magazine, La vie de famille. 8This change to more female honorary members in 1885 coincides with other changes as well. When the number of honorary members made the list too long to print, Colonne began to use the programmes for other purposes. In 1885-86, explaining that his concerts that season would “form a complete summary of the history of music”, he included extensive programme notes, probably written by Charles Malherbe, archivist at the Opéra. As they got longer, the notes became like chapters in a music-history textbook, including dates of composition, some biographical details, and the works’ performance history. On 10 January 1886, composers’ dates appear for the first time. Later programmes that season include long analytical essays by Berlioz on the Beethoven symphonies. Such steps could suggest that historical and analytical issues were increasingly of interest to Colonne’s audiences, but I interpret it rather as Colonne’s increasing desire to educate his audiences about the music they were hearing. 9More women and families among his supporters may have motivated this concern for education – the programmes certainly reflect an increasing orientation towards them. When they were having financial problems from 1889 to 1894, Colonne engaged two family magazines to publish their programmes: the weekly La vie de famille and the monthly Le Figaro musical (Illustration 1). In line with the explicit purpose of the former to “amuse, instruct, and interest”, these programmes included composer portraits and biographies, often independent of whose works were being performed, and advertisements for fashion and youth education targeting women and children. Ads were not just in the back of the programmes or interspersed in the notes, but also right up front. Those in Illustration 2 lie opposite the list of works in many programmes of the late 1880s and 1890s. This juxtaposition is very telling, for, like fashion ads, by analogy draw attention to the aesthetic value of the concerts – their ability to bring beauty into one’s life –, these signal the concerts’ social and educational function as well. By the late 1890s, programs had grown to twelve pages, and there were ads for not only upcoming concerts and musical instruments, fashion and family magazines, but also heating, Badoit water, candy, brasseries, and bathroom installations. The Concerts Colonne had become an important part of life, part of the consumer society, something to improve your life. For some a ritual, it even substituted for church on Sunday. Such a close association with families marks a major change from the 1870s, when the organisation attracted mostly professional and amateur musicians. 2. 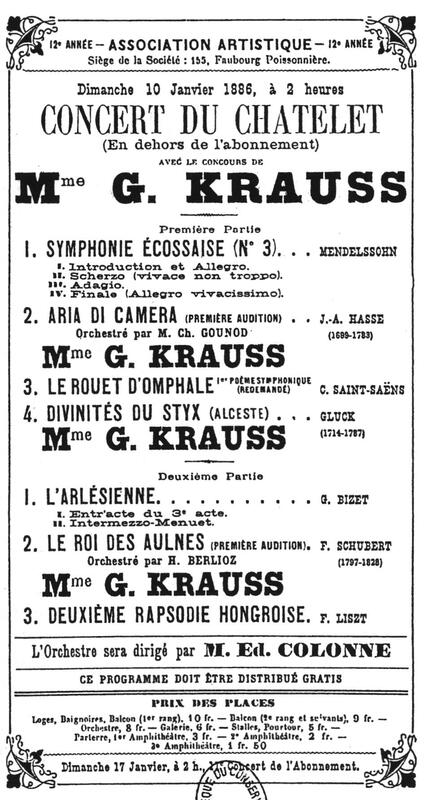 Ads facing the list of works in Concerts Colonne programmes of the late 1880s and 1890s. 10How did Colonne contribute to this transformation of the role and place of music in people’s lives? How did he attract audiences and keep them coming, especially the less sophisticated, needed for the organisation to grow? First, by offering attendance at dress rehearsals, he insured that they would understand the hard work needed for a good performance and so better appreciate the musicians. Second, he taught them proper behaviour at concerts. Whereas in private concerts listeners sometimes moved around and left at will, on virtually every Colonne programme there is printed, “please do not enter nor leave during the performance of the pieces”9. Third and perhaps most importantly, he rewarded their interest by encouraging audience self-expression, welcoming applause, and accommodating their wishes. The minutes kept by the secretary of the organisation document each time the audience liked a work or movement and how long the applause lasted. In spring 1897, for example, three minutes of applause interrupted the movements of the Beethoven violin concerto, and clapping lasted over ten minutes for the third act of Siegfried- making the work one of their “greatest successes”. He also notes how often Colonne was willing to do an encore of favourites, even in the middle of multi-sectional works like Damnation de Faust, and how competing orchestras were faring. As the number of concerts grew, it became increasingly important for Colonne to understand his audience’s preferences and find appropriate means to address them. 11Colonne’s sensitivity to audience preferences and his desire to accommodate them got the organisation off to a good start. His first lesson came from the annual Concert Spiritual, on Good Friday evening. That of 1875, which premiered excerpts from Saint-Saëns’ Samson et Dalila and Gounod’s Jésus, with Beethoven’s Ninth, was the highest grossing of the year, earning 4,806 francs or 12% of their annual concert receipts. In 1876, with selections from Berlioz’ Enfance du Christ and Saint-Saëns’ Déluge, it again earned the annual high as did that of 1877. In 1879 their performance of Massenet’s Eve on this occasion brought an all-time high of 8,128 francs at the door and an evening total of 10,626 francs10. Such an experience taught Colonne that ticket sales the day of the concert could play a major role in boosting the organisation’s earnings11. 12For the most part, in his first seasons Colonne imitated his predecessors – starting with a Beethoven symphony and proceeding with other genres. However, though they were generally the cheapest to produce, concerts of orchestral music did not do very well. In 1874-75, for example, one with works by Haydn, Joncières, Handel, Beethoven, and Saint-Saëns had the worst sales at the door for the year (321 fr). In his second and third seasons, similar concerts attracted even fewer sales at the door – 317 francs on 31 October 1875 and 227 francs on 29 October 1876. Five such concerts earned less than 300 francs in ticket sales at the door in 1875-76, and six less than 400 francs. 13What may have cooled audiences to these programmes were the premieres of French works on most of them12. Colonne was committed to integrating new works within the conventional programming formula, but apparently the canon was not enough to attract his public, and their sense of patriotism did not extend to supporting their musical contemporaries. Concerts with Handel and Lully also did poorly, suggesting that early music had not yet penetrated French taste. One with the lowest ticket sales at the door of all, 202 francs, presented a Mendelssohn symphony, Beethoven concerto, Lalo overture, and Rameau air, orchestrated by Gevaert. 14Colonne’s most important strategy in the 1870s was to repeat a work in response to audience demand. After the success of Bizet’s Arlésienne, on 22 November 1874, he reprogrammed it on 7 February 187513. A similar reception on 13 December 1874, for Mendelssohn’s Midsummer Night’s Dream – a long-time favourite at the Société des Concerts – led to repeating it on 21 February 1875. Sometimes advance sales for concerts with audience favourites brought in more than the total receipts of an average concert, such as was the case on 12 December 1875,when Colonne presented Beethoven’s “Pastoral Symphony” and again Bizet’s Arlésienne. Taking advantage of audience taste and the relatively low cost of such performances, Colonne programmed works such as these again and again for decades. 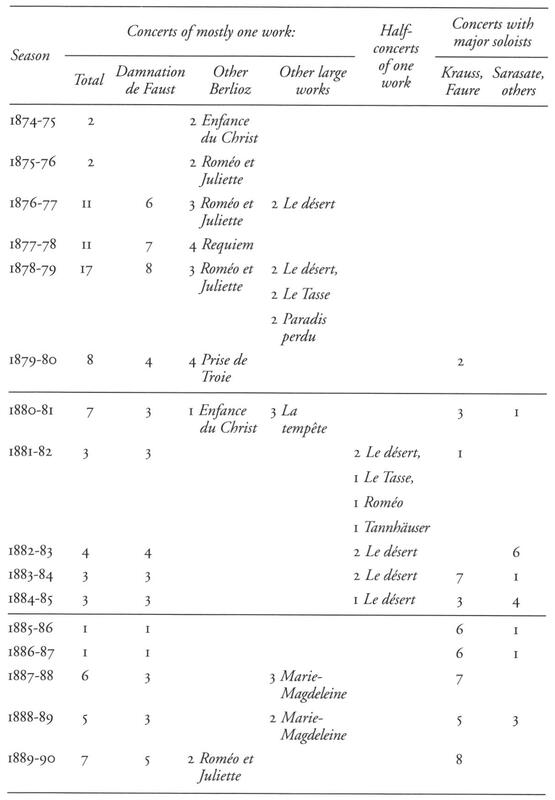 15The most successful concerts of the 1870s featured soloists and chorus, especially in large works by Berlioz (see Table 2). Until the 1870s audiences knew only excerpts. Colonne’s efforts to perform whole pieces by the composer, despite the elevated cost of hiring extra performers, paid off in the audience interest and critical attention he received. Average ticket sales doubled for their first performance of Enfance du Christ, on 10 January 1875. Sales at the door rose to 1,941 francs and total receipts to 4,094 francs. Capitalising on this, Colonne reprogrammed the work the following Sunday, earning another 3,096 francs. Unfortunately choral expenses that year-10,788 francs, the equivalent of one fourth of their total ticket sales undercut the effect of these successes. 16The following season, on 28 November 1875, Colonne saw his first success, with Berlioz’ Roméo et Juliette. Part of the attraction was hearing the entire work – Reyer noted that, although serious musicians knew the score, few had heard it in its entirety14. Given its complexity as well as its need for “artists of the first order” and many rehearsals, critics called Colonne “bold”. His performance earned an unprecedented 5,219 francs. Reyer was “surprised and almost completely satisfied”, noting that, if the public did not clap enough, at least they listened “religiously”. It was gratifying to be the first reviewed in his column and significant to receive praise from a friend of Berlioz and such an influential critic. Colonne excerpted fragments of Roméo on 19 December and 3 April. Still these successes were not enough to counterbalance the weak earnings from the orchestral concerts that year, and total annual sales at the door decreased from 18,487 to 13,005 francs (see Table 1). 17When the first concert of 1876-77 earned only 227 francs at the door, even with excerpts from Roméo, Colonne again turned to a large work with soloists and chorus: David’s “symphonic ode”, Le désert. Sales at the door for 17 and 24 December concerts set a new record at 4,948 and 5,007 francs. This gave Colonne the courage to be even bolder. Next he programmed Berlioz’ Damnation de Faust Not only was the work expensive to produce, it was also known for its difficulty and the public indifference at its 1846 premiere. But the Société des Concerts was beginning to have success with excerpts performed five times in 1872 and in April 187415. When they performed the whole first half, on 13 and 20 February 1876, Reyer asked to hear the rest of it, hoping the Société would respond. Instead its competitors took up the challenge. The Concerts Pasdeloup, which had also done sections of it in 1876, scheduled Parts One and Two on π February 1877 and the entire work a week later. Colonne chose the same date to give his complete Damnation, thereby taking on his principal rival, Pasdeloup, and asking for comparison with the prestigious Société des Concerts. 18Of course the major critics attended Pasdeloup’s performance and praised it, but when they heard Colonne’s the following week, they had to admit it was “more carefully prepared”. Colonne’s first performance of Damnation on 18 February 1877 earned almost 4,000 in sales at the door, and 5,570 francs total. But the second performance a week later “à la demande générale”, earned 1000 francs more – 6,652 francs. In Art musical (22 February 1877), Henri Cohen called it “not a victory but a triumph”. Le ménestrel (25 February 1877) reported that, if it were possible, they would have encored every number. When Colonne’s Faust fell ill, Pasdeloup acknowledged Colonne’s achievement, and for their third performance on 4 March, generously released his own Faust, Τalazac. This earned another 6,639 francs. A critic in Art musical (8 March 1877) predicted a fourth performance, explaining “never has a work excited such an enthusiasm, a justified enthusiasm”16. 19Faced with these successes, on 5 March 1877 Colonne’s administrative committee met and agreed to give Damnation again on 11 March. By public request, they also did it three more times that month, for a total of six that season. Each made more than 4,000 francs at the door and grossed over 6,000 francs. Sales for these performances totalled 27,169 francs in tickets at the door, or 51% of the year-end total, and 38,249 francs in total ticket sales, or 44% of their annual total. The performance on March 18, advertised as “the fifth and last performance”, brought in 5,009 francs at the door and grossed 6,639 francs, the season’s best. 20When Reyer asked for still more performances, Colonne convened all orchestra members on 2 April. Of the 62 voting members, 17 voted for and 45 against continuing to play Damnation. It had already been their best season, with nine concerts earning more than 4,000 francs at the door and only one earning less than 300 francs at the door. This success resulted in a 49% increase in honorary members and a 54% increase in their contributions (see Table 1). Colonne’s orchestra is now the highest ranking [le premier rang] after that of the Conservatoire. No one contests the efforts of their brave conductor, the great usefulness [utilité] of the concerts he conducts so ably, the good that these interesting concerts have already done in making a lot of new composers known and especially in rendering Berlioz popular17. 22This experience taught Colonne a new tactic for attracting a public: perform a large popular work on consecutive Sundays until ticket sales drop off. When earnings ebb, announce the following concert as the last18. Wanting to build on these successes and perhaps test the limits of audience taste, Colonne reprogrammed Damnation again in fall 1877, just before Christmas. Reyer called it “as perfect as is possible to wish for”. This concert grossed the highest sales in the organisation’s history (7,009 francs, with 5,552 francs at the door) and they did it seven more times that season. Each performance brought in over 5,000 francs at the door. Sales for these performances came to 42,847 francs, or 40% of their receipts for the season, though it cost to pay 200 extra performers per concert. That spring 1878, Colonne gave four performances of another large work, Berlioz’ Requiem. This was somewhat less successful than Damnation, but nonetheless earned an average of 3,000 francs at the door, 14,284 total. With eleven of their twenty-four concerts that season being performances of single large works, Colonne found a new way to build his public and increase his earnings. 23In 1878-79, he increased the number of concerts with a large work to seventeen, or 71% of their season (see Table 2). The two performances of Damnation beginning the season earned somewhat less than the previous year’s average (4,415 and 4,864 fr). However, when the programme noted that their next performance of it would be the “16th and last”, the crowd increased, bringing in 6,808 francs. A “17th and last performance” attracted an unprecedented 7,009 francs. Advertising the 24 November concert as “irrevocably the 18th and last performance” of Damnation, they earned still more, 7,279 francs. These eight performances contributed 43% of their total annual revenues. 24Although it was not as successful as Damnation, Colonne reprogrammed Roméo three times and tried the same tactic to attract audiences to Dubois’s Le paradis perdu, Godard’s Le Tasse, and David’s Le désert. Each called for four or five soloists and chorus, each was performed twice. The first earned a respectable 3,560 francs for its premiere, but only 2,304 francs the following week. The soloists cost 1,600 francs. Le Tasse did better, earning 3,798 and 4,048 francs, but cost 5,245 for soloists and chorus. In the end, while receipts went up that year from 107,054 to 114,031, expenses went up more: the cost of soloists almost doubled, choral expenses increased 11%. Meanwhile sales at the door decreased 10% and honorary member contributions 5.6%. Four concerts with premieres by foreign composers (Max Bruch, Rubenstein, and Tchaikovsky) earned less than 1,000 francs. 25In response, Colonne reduced spending on soloists and choruses in 1879-80, but continued performing large works, especially by Berlioz. In December, he added La prise de Troie. Its first performance brought in 6,412 francs, with 4,002 at the door. But audiences did not respond as they did with Damnation. Each of the next three performances earned less until, on 28 December, they took in a mere 1,039 francs at the door, 2,778 total. Colonne shifted to three performances of Damnation, earning 18,945. A performance of Godard’s Le Tasse in March earned 3,236 francs and a fourth Damnation in April 5,240 francs, securing a better year-end situation for the orchestra. 26These financial figures suggest a different picture than that which critics and subsequent historians have portrayed. It is true that Berlioz appeared increasingly on concert programmes of the 1870s, and not just on the Concerts Colonne. As the Annales of 1877 reports, he “became the favourite of this public, the smallest note arousing tons of bravos”. Their response caused some to wonder if people weren’t “admiring by fashion and command” rather than out of true interest19. But apparently, as we have seen here, not all Berlioz’ works were received with the same enthusiasm. Colonne s third performance of his Requiem in March 1878 saw a 1,500-franc drop in receipts the same day Pasdeloup played Damnation, even though the latter’s was judged imperfect. Receipts for Roméo went down with each performance in 187920. And in spring 1880, the same was true of the La prise de Troie. Its fourth performance earned only 400 francs more than the worst concert of the season. This suggests that, while a Berlioz cult may have been emerging in the late 1870s, it was the “powerful effect” of Damnation in particular that attracted audiences, rather than Berlioz per se. 27The 1870s was a period in which the Concerts Colonne rapidly became a major contender for Parisian audiences. What attracted the public in increasing numbers was not only the quality of their performances, but also their choice of repertoire – Arlésienne, Le rouet d’Omphale, and Danse macabre as well as Damnation de Faust – audience favorites for decades. 28In the 1880s, with the advent of a fourth major orchestra conducted by Charles Lamoureux, Colonne’s competition increased. Still, like the Société des Concerts, Colonne had the advantage of a stable performing venue, the Théâtre de Châtelet, while Lamoureux often had to move. In this decade, as Tables 1 and 2 suggest, Colonne continued to count on large works to bring in substantial profits, but to a much lesser extent. He also turned to two new tactics to attract the public. First, he hired superstar soloists and second, in part to compete with Lamoureux, he began to play more and more Wagner. 21 Soloists in Damnation, for example, such as Mlle Vergin and M. Villart, got 200 fr per concert. 29The first practice began in fall 1879. The minutes of the administrative committee’s meeting on 3 November 1879 describe negotiations with the opera singer, Jean-Baptiste Faure. If his concerts earned more than 6,000 francs, Faure wanted part of the gross (less 25%). They settled on a fixed fee of 2,000 francs per concert, an unprecedented ten times what most other soloists received21. This gamble paid off, for, with his participation, the concert with Schumann, Rossini, Saint-Saëns, and Gounod grossed the highest in their history, earning 9,072 francs in sales at the door and 11,552 francs total. Colonne repeated most of the concert the following Sunday and did just as well. (By contrast, the least successful concert of the season [featuring Tchaikovsky] earned only 781 francs at the door). 30In 1880-81, with subscriptions up 21%, Faure was hired to sing in four concerts, including the Concerts Spiritual. Ticket prices were raised to support his fee. Counting on Faure’s popularity, Colonne scheduled him to premiere Alphonse Duvernoy’s symphonic poem, La tempête. Again, the concert surpassed previous earnings, with 14,264 francs in sales at the door and 16,376 francs gross. Faure’s concerts, earning 55,139 francs or 40% of the annual concert receipts, gave Colonne a new way to stay afloat financially. 31Bolstered by other, predictable successes that season – three performances of Damnation (14% of their annual income), two of Enfance du Christ (which earned only slightly more than their orchestral concerts), and one with the violinist Sarasate (5,644 fr) – Colonne took some risks. This included doing Rameau’s Castor et Pollux and premieres by Lalo, Diémer, Dubois, Godard, Saint-Saëns, and Widor. Four of these concerts earned less than 1,000 francs at the door. Colonne also introduced his audiences that year to Wagner – the overture to Tannhäuser on 8 February 1880, Siegfried’s “Idyll” on 14 November 1880, and the Ride of the Walkyries on 23 January 1881. Sensing audience enthusiasm for the latter, he reprogrammed it again on the two successive Sundays, and ticket sales at the door rose 1,000 francs for each performance. 32With ticket sales at the door up 13% and subscriptions for 1881-82 up another 26%, Colonne pursued a similar strategy the next season. This time he added more Wagner, balanced with more Berlioz. Every concert that year had one, the other, or both. Excerpts from Wagner’s Tannhäuser were performed seven times, though often with established audience favorites such as David’s Le désert (3 times), Godard’s Le Tasse, and Berlioz. Without these pairings, Wagner’s music did not do particularly well, especially as compared to the three performances of Damnation, which grossed over 7,000 each. The least successful concerts were two orchestral ones, including their fifth performance of the Ride of the Walkyries. The highest earning of the season, with 11,335 in sales at the door and a total of 13,621 francs, featured the opera singers performing Gounod duos and an air from Saint-Saëns’ Etienne Marcel. 33In 1882-83, total receipts rose by slightly revising previous strategies. On his first five concerts, Colonne featured more soloists but less expensive ones (paid 250 to 600 fr per concert). Sarasate, whose fee increased to 2,000 francs, was the exception. Colonne also continued to introduce his audiences to Wagner. His first programme presented a Parsifal prelude with Sarasate in the Mendelssohn violin concerto and excerpts from Berlioz’ Roméo. The concert earned 6,305 francs gross even though Lamoureux and Pasdeloup also did it the same day. On 25 February and 4 March, he also took on his rivals with a “Wagner Festival” (including their premiere of the prelude and march from Lohengrin). The first concert earned the highest that season (8,603 fr) Lamoureux did his own “Wagner Festival” the following week directly competing with the second week of Colonne’s Festival with some of the same pieces. While Colonne’s earnings dropped somewhat, his concert on March 4 still produced 6,073 francs. Colonne’s concerts with Wagner also did well on 19 November (7,432 fr gross), 26 November (7,247 fr gross), 28 January (7,084 fr gross), 4 March (6,073 fr gross), and 23 March (5,510 fr gross) – sometimes even better than old favourites like Le désert (which grossed between 5,901 and 6,749 fr that winter) and Damnation (which earned between 6,867 and 7,652 fr). 34The 1883-84 season was not only the most successful so far, it earned more than any other for the next two decades. In part, this was because Colonne spent three times more on major soloists who appeared eight times, 25% more on choruses, and 57% more on supplementary artists (see Tables 1 and 2). He backed this up with more promotion including, for the first time, ads in Le Figaro. The season started out well. Three performances of Damnation in the fall earned even more than in previous years, as did a succession of orchestral concerts with audience favourites (Midsummer’s Night’s Dream and Beethoven’s Ninth symphony). The premiere of Brahms’ Danses hongroises on 4 November earned the least but still 4,003 francs. Then, after 9 December, 12 of the remaining 17 concerts featured some work by Wagner. That of 16 December had to compete with Wagner at the Société des Concerts and still earned 7,823 francs, while that of 6 January only earned 4,529 francs when Lamoureux presented the funeral march from Götterdämmerung. These concerts did moderately well, but they were also expensive, requiring not only soloists and chorists, but also high publisher’s fees. 35Colonne continued to balance the rising popularity of Wagner with French music on the same programmes – five performances of Saint-Saëns’ Henri VIII, lots of Gounod songs, and Berlioz on ten concerts. Audience taste, however, did not always concur, for the two concerts with Berlioz’ Symphonie fantastique, on 20 and 27 January, were among the least successful of the season (the latter earned only 1783 fr in sales at the door, the season low). 36In the spring, Colonne presented five successive concerts, with M. Faure this time singing Wagner. Those of 9 and 16 March, with excerpts from Tannhäuser, earned 15,070 and 12,525 francs, even with Van Dyck singing Tristan at the Concerts Lamoureux. In four of these concerts, Faure sang Wagner interspersed with French music, especially Gounod songs. This gave audiences the opportunity to hear exerpts from Massenet’s Hérodiade three times, Reyer’s Sigurd twice, and Salvayre’s Richard III. Even though Faure’s fee increased to 2,500 per performance, each of these concerts made money, bringing in a total of 68,806, or 31% of their annual income. To keep audiences tantalised, the concert management used the same tactics as with Damnation, that is, advertising Faure’s appearance on 16 March as “irrevocably the last” of the season. 37Soloists such as Mme Fidès-Devriès and Sarasate appeared in other concerts juxtaposing Wagner and French music that spring. Both performed opposite Wagner at the Concerts Pasdeloup, the former also simultaneously against Wagner at the Société des Concerts. And both did well, earning them 10,131 and 5,148 francs respectively. But no one cost more nor earned them more than the Russian pianist, Anton Rubinstein. Hired to perform his own Fourth Piano Concerto on 30 March, he demanded a portion of the gross receipts, 17,039 francs. In part because ticket prices were quadrupled, his concert earned the most in the organisation’s history (through 1914): 24,729 francs. 38Of course with such an increase in their expenses 40% overall for the season – the organisation was risking a lot. But ticket sales at the door rose 80%, to 154,037 francs, and no concert earned less than 1,000 francs in sales at the door. As a result, for the first time orchestra members could pay themselves four francs per appearance – double what they had received in 1878-79. This success also led to a 20% increase in subscriptions sales the following year, an increase in honorary members to 752, and a 27% increase in their contributions – almost twice subscription sales for the season. 39Unfortunately, from 1884-85 through the end of the decade, the Concerts Colonne found maintaining this level of success a complex matter, as the ebbs and flows in the financial records of Table 1 suggest. Repertoire choices do not entirely explain the cyclical nature of their finances. These changed very little. Colonne continued to do Damnation, though fewer times (see Table 2), and to balance Wagner with Berlioz or other French music. Unlike Lamoureux, he did not radically increase the number of concerts with Wagner mid-century. He also continued to give premieres of new works, despite their poor return, though far fewer, and incorporated some early music, Rameau’s Castor et Pollux and Beaujoyeulx’s sixteenth-century Le ballet comique de la royne. 40To turn a profit, Colonne also continued to hire major soloists (see Table 2), not just Faure and Sarasate, but also H. v. Bülow, M. Engel and M. Bosquin (both known for their Wagner), and Mme Gabrielle Krauss of the Opéra. All were paid at least 2,500 francs per concert. Mme Krauss was the most popular, the first to have her name appear in huge letters on the programme (Illustration 3). Her two concerts in January 1886, with the same Gluck, Gounod, and Schubert as in the previous year22, earned the season high both in sales at the door (13,375 and 11,157 fr) and in total receipts (15,708 and 12,531 fr). On the basis of these successes in 1885-86, orchestra members received an unprecedented 4.5 francs per appearance. 3. Concerts Colonne Programme of 10 January 1886 featuring Mme Krauss as soloist. 41Colonne’s only new strategy in the late 1880s was to promote their concerts as a form of education. This he did with longer explanatory notes and renewed attention to Beethoven, as if he represented the beginning of orchestral music. On 7 November 1886, for example, they did six Beethoven works and on 14 November seven of his works – a status previously given only to Berlioz and Wagner. This concert, however, earned only 4,081 francs, perhaps due to competition with another orchestra. 42The next few years were much slower ones for the orchestra. In 1886-87, the orchestra added more Wagner to their repertoire, especially from Parsifal. These performances were accompanied by long programme notes sometimes with musical excerpts of the various musical themes. However, ticket sales were not as good as they had been, and the Parsifal excerpts earned only 3,709, 4,075, and 5,691 francs (the latter even when accompanied by the ever-popular Midsummer Night’s Dream). The only concerts of this season that did well were those with the major soloists, though Colonne had them doing premieres of new works alongside audience favourites23. To explain their problems, Colonne pointed to the economic slowdown in the country. 43In 1887-88, Colonne significantly increased spending on soloists and chorists, but saw only a slight increase in receipts. Only Mme Krauss consistently brought high attendance. She sang Gluck seven times, Massenet’s Marie Magdeleine three times, and Marguerite in Damnation twice. Each concert brought in over 10,000 francs. Colonne also did Schumann’s Manfred twice and the second act of Les Troyens twice; however, ticket sales were down on these concerts, those of Les Troyens pulling in only 3,653 and 3,157 francs. 44The following year, forced to cut their spending on soloists and choruses, they had even less success with the public. Mme Krauss performed seven times (the same repertoire as the previous year); M. Brouhy also sang some Gluck; and most concerts featured at least some Wagner and/or Berlioz, as had been their tradition. The orchestra took part in two concerts, under the auspices of the 1889 Exhibition, after its regular season, during which they presented a Saint-Saëns festival, with the aid of Mme Krauss and Paderewski, and a concert of works by a wide range of contemporary French composers. But seven concerts earned less than 1,000 francs in sales at the door, these dropped 31%, and total concert receipts went down to a seven-year low. 45In 1889-90, subscriptions sales surprisingly went up, but sales at the door went down again, despite selling their tickets at fourteen places in the city and giving premieres of works by Wagner, Gluck, and Russian composers. The premiere of the “Death of Siegfried” from Götterdämmerung attracted only 5,561 francs in ticket sales and, similarly, the Parisian premiere of Act 1, Scene 1 of Das Rheingold brought in only 3,790 francs. Likewise, the Parisian premieres of the Cavatina from Borodin’s Prince Igor and Act 2, Scene 3 from Siegfried. only earned 4,051 francs. Two concerts that did relatively well, earning 6,600 and 6,176 francs, featured works by Augusta Holmès, composer of the successful Ode triomphale, written for opening night of the 1889 Exhibition that fall24. More substantial earnings that season came only from concerts with Mme Krauss. Her all-Gounod concert on 4 April and five performances of Damnation each earned over 10,000 francs. To help the organisation stay float financially, Mme Krauss lowered her fee to 1,500 francs per concert, and organisers raised ticket prices 70%. Facing another season of limited revenues, orchestra members were forced to decrease their wages to four francs per appearance. 46With the added competition of the Concerts Lamoureux, staying afloat in the 1880s was thus not easy. Table 1 reveals a huge variance in income from year to year as they struggled to find the right balance of repertoire and expenses. In 1883-84, for example, they experienced a direct relationship between spending on prestigious soloists and greater ticket sales at the door. But this was not true in subsequent years and, though they continued to hire major soloists, their income fluctuated, not reaching what it had been in 1883-84 until 1896-97. When they won audiences away from their competitors doing Wagner the same day, they could earn 8,000 francs or more, over 10,000 francs with major soloists. But when they lost out to their competitors’ Wagner, earnings often dropped to around 6,000 francs. Perhaps for the sake of nationalist balance – or at least to diffuse any political association with Wagner – they also continued to push Berlioz, even works in which audiences showed little interest. In 1889-90, for example, they performed eight works by Berlioz on 16 of their 24 concerts, nine works by Wagner on nine concerts, and works by both on five concerts. Only Beethoven (in nine concerts) and Saint-Saëns (in eight) were given so much attention. Still none of these strategies was enough to keep their earnings high. This decade taught them that strong determination and the continual readjustment of their priorities were necessary for the organisation’s longterm success. 25 M. Faure retired from the stage in 1886, and Mme Krauss in 1888. 47The 1890s started out very slow for a number of reasons. M. Faure and Mme Krauss retired25 after appearing on about a quarter to a third of their programmes from 1883 to 1890, and no one had similar appeal. At the same time, Colonne became more political, perhaps to elicit an increase in the government’s subsidy. In 1890-91, he dramatically increased the French music on their programmes. Although their Saint-Saëns Festival in June 1890 had earned only 3,720 francs, Saint-Saëns appeared in fifteen concerts that season, Massenet in eight concerts, and Bizet was the focus of an entire concert. Moreover in seventeen of their twenty-four concerts, they did premieres: 29 new works of which 26 were by French composers. Some concerts had up to three premieres, thirteen featured second performances of new works, and eight featured works by French women composers (Holmès was on six of them). To support of the government’s budding alliance with Russia, they also did two concerts of Russian works, one with all Tchaikovsky conducted by the composer. 48To pay for these decisions, Colonne slashed spending on soloists and chorists by 75%. No one costing more than 300 francs was hired, even for Damnation. Only able to afford orchestral works, Colonne looked to Wagner and Berlioz to assure his success. In 1890-91, either composer or both were on almost every concert Wagner in sixteen concerts, Berlioz in twelve, and both in eight of them. He also began to use a consistently appealing genre, marches, as a way to end concerts. Unfortunately these strategies did not work. Earnings and contributions dropped to what they had been in the mid-1870s (subscriptions dropped for the next three years). Only one concert earned more than 9,000 in ticket sales at the door (Damnation), while over four earned less than 1,000 francs at the door. 49The government increased its subsidy to 15,000 francs annually, and Colonne continued with the same kind of repertoire the following year, the only real change being somewhat less Berlioz and Saint-Saëns, much more Beethoven (in 20 concerts as opposed to 9 the year before) and five concerts with Russian music. In eighteen concerts they again gave 29 premieres including 23 new works by French composers, this time including d’Indy and Charpentier. Four concerts again included French women composers and nine gave second performances of new works. But, although they spent slightly more on soloists and twice as much on chorists that season and even with the savings of having a family magazine publish their programme books, sales at the door went up only slightly, and total revenues again went down. 50In fall 1892, Colonne had no choice but to return to a tactic of proven success. They opened with four performances of Damnation, raising 39,000 francs. Though these entailed added expense, they also returned to doing more large works: Damnation one more time, Enfance du Christ four times, and Franck’s Béatitudes three times (see Table 2). They also reduced the number of premieres to four and Wagner to seven concerts, and doubled the amount of Berlioz to fourteen concerts. Appearing in five concerts, Charpentier proved the most popular younger composer that season. An unexpected success was the early music by the Société Chorale Amsterdamsch a capella Koor, in February. Paid 2,830 francs, they drew in 8,261 francs. In part because no concerts earned less than 1,000 francs, sales at the door for the year went up 29%, and total revenues 21%. With these results, orchestra members raised their salaries back to 4.5 francs per appearance. 51From 1892 to 1896, Colonne maintained relative stability in his extra-orchestral spending and saw ticket sales at the door remain nearly constant (see Τable 1). At the same time, he continued to promote certain agendas. First, he reiterated his support for the Franco-Russian alliance by starting the 1893 season with a “Franco-Russian” festival and continuing later with five other concerts of Russian music, performing a total of 24 Russian works. In March 1894, he himself went to conduct in Russia, during which time Felix Mottl and Hermann Levi took his baton. Second, Colonne continued his promotion of Berlioz, sometimes to balance Wagner (Illustration 4). 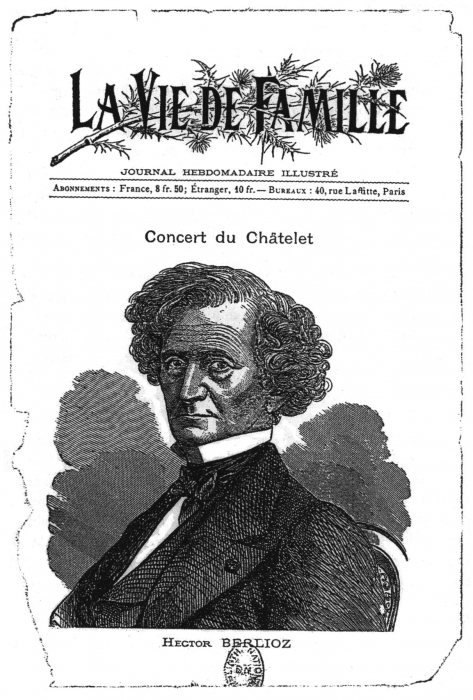 In 1894-95, he gave twelve concerts of all Berlioz (and 17 others with programmes that included Berlioz). 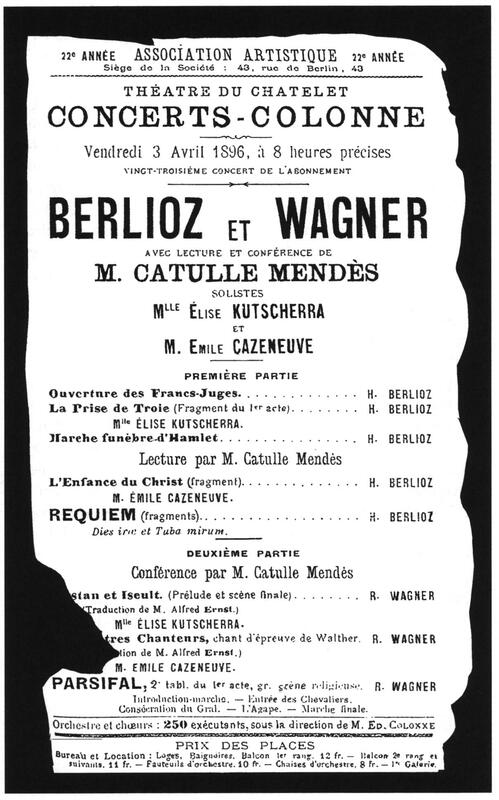 Although, except for the four Damnation, these concerts averaged only 6,625 francs (some earned 2,000 less), Colonne also programmed Berlioz on seventeen concerts in 1895-96, three times with Wagner (Illustration 4). Third, along with having to bear the cost of the large Berlioz works, in 1895-96 Colonne returned doing premieres on more than half his concerts. The 16 new works, 13 of them by living French composers, led to not only decreased sales at the door and annual receipts, but also a drop in performers’ wages from 4.75 francs back to 4.30 francs per appearance. 52In 1896-97 Colonne experienced an unprecedented success. While expenses stayed almost constant, total sales at the door and concert receipts rose to unprecedented highs, the former increasing almost 50%, the latter 24%. Subscriptions for the following year more than doubled. What changed? Colonne decreased the number of premieres from sixteen to ten and the number of concerts with music by living French composers from twenty-seven to eighteen. Only the fall Russian festival had low earnings that season. With this in mind and the Franco-Russian alliance now formally in place, Colonne began to give more attention to German or German-influenced composers (though not so much Mendelssohn as before). Mottl’s two concerts with Wagner earned over 32,000 francs, though the one with all Wagner did less well than the one with Berlioz, Strauss, Mozart, Beethoven with Wagner, earning 15,214 francs at the door. Other well-attended concerts included Schumann’s Manfred and Franck’s Rédemption. Franck, who previously appeared on only two concerts per year at most, was performed on four concerts in 1896-97 (five concerts in 1898-99). 53Buoyed by this success, in fall 1897 Colonne tried his most radical strategy so far: organising programmes in an explicitly educational way. To enact his experiment, Colonne chose Beethoven, Schumann and Wagner, the first a composer who “marks the line of demarcation between old and new times”, the second “the poet of the soul”, and the third one who “opened art to new paths”. Many concerts that season presented an overture by Schumann, a Beethoven symphony, a concerto by someone else, and an overture by Wagner. He hoped that “the transformation of matter, the progress of style, the influence of a period, the action of time, would become clear and give attentive listener a subject for comparison and study”26. In 1897 Colonne also initiated a chamber-music series, on Thursday nights at the Nouveau Théâtre, in which he gave renewed attention to “musique ancienne”. When the new series had a hard time attracting audiences, Colonne doubled spending on well-known soloists. This almost doubled their receipts, but proved too expensive, and the series was cancelled in 1901. 4. Concerts Colonne Programme of 3 April 1896 featuring lectures by Catulle Mendès. 54By the end of the century, it was clear that Colonne was considering a fresh balance between old and new, French and German music. In their 25th anniversary season 1898-99, he dedicated entire concerts to four composers – one each for Wagner and Beethoven, two each for Saint-Saëns and Massenet – half-concerts were also given to Wagner, Bach, and Mozart. Berlioz appeared on ten concerts that season, Franck on five, and d’Indy on four. Holmès and Chaminade were played and Russian composers featured on two concerts each. Colonne premiered 15 more new works for a total of 144 from 1889-1899, 105 composed by French living composers. But Wagner’s music made more than any of these – double the income of most concerts, including Damnation, except when there were important soloists (Paderewski earned 14,511 francs for the year’s high). German and German-influenced music was growing in importance, though even Wagner could not be counted on for financial security. The 1890s taught Colonne that income fluctuations were increasingly unpredictable and independent of who they performed. 55To render orchestral music popular then meant constantly reconsidering the balance between the need for variety, works chosen for their artistic value (including new and little-known works), orchestral music (in a period that valued vocal works), and audience favourites. That the Concerts Colonne – today the Orchestre Colonne – still performs regularly in Paris, averaging twelve concerts per season, is evidence of both the dedication of its players, who continue to perform for a portion of the concert revenues, and the skilfulness, intelligence, and sensitivity of their founder and his successors. Along with his tenacity to find right programming strategies, Colonne knew how to adapt to changing times. * Archival sources include Procès-verbaux du Comité d’administration [Minutes], 1874-78,1878-79,1886-1901; Grand livre des comptes [financial ledgers], 1874-1886, 1886-1901; Concert Programmes, one volume per year, 1874-1900. Concert Receipts include advance purchases through multiple venues. Expenses not listed include theater rental (until 1901, 10% gross receipts), theater staff, firemen, police, heat, lighting, administration, supplementary artists, composer/author royalties (5%), public assistance (5%), publisher fees, music rental/copying, instrumental rental/purchase, programme and postal expenses, advertising. Prenant appui sur l’étude des archives des concerts Colonne, cet article montre comment Colonne forma un public pour la musique orchestrale et contribua à faire de son orchestre l’un des plus importants du Paris de la fin du XIXe siècle. Lorsqu’on compare les livres de comptes et le répertoire des œuvres, on s’aperçoit que Colonne adaptait constamment sa stratégie au goût du public. Il comprit rapidement que la vente au guichet rapportait moins que les abonnements, et que les chanteurs célèbres de l’Opéra et les grandes œuvres avec chœurs attiraient davantage le public que la musique orchestrale. Mais aucune tactique ne fonctionnait longtemps, et ni la popularité de Berlioz dans les années 1870 ni celle de Wagner dans les années 1880 et 1890 n’étaient totalement prévisibles. Réévaluant sans cesse l’équilibre entre les œuvres anciennes et nouvelles, entre la musique vocale et instrumentale, entre la musique française et étrangère, entre le divertissement et l’éducation, Colonne mit en place des stratégies successives – certaines empruntées à ses prédécesseurs et d’autres totalement neuves – qui assurèrent la viabilité et le développement des concerts. Ces stratégies révèlent non seulement le changement du goût du public, mais aussi les limites que mettait Colonne à le contenter, ainsi que la priorité qu’il pouvait donner à différents événements musicaux et politiques. Etudiant la relation entre la production de l’orchestre et la réception du public avant 1900, cet article montre que les conditions du marché changèrent continuellement pendant cette période. La souplesse avec laquelle Colonne s’y adapta fut la clé de son succès. Dieser Beitrag analysiert die Art und Weise, in der Edouard Colonne einerseits ein Publikum fur seine Orchesterkonzerte schufund andererseits sein Orchester zu einem der wichtigsten im Paris des ausgehenden 19. Jahrhunderts machte. Dabei konzentriertsich die Untersuchungauf den Verkauf der Eintrittskarten für jedes Konzert und auf die jâhrlichen Veranderungen der Einnahmen und Ausgaben der Orchester, galt doch die finanzielle Starke eines Orchesters lange Zeit als zentrales Moment seines dauerhaften Erfolges. Der Vergleich zwischen den finanziellen Entwicklungen (Tabelle 1) und den Entwicklungen des Repertoires (Tabelle 2) dokumentiert einen ständigen Wechsel von Colonnes Strategien, um dem Geschmack des Publikums zu entsprechen. Colonne erkannte schnell, dass der Verkauf von Eintrittskartenfinanziell wichtiger war als Subskriptionen und dass bekannte Opernsolisten und groẞe Werke das Publikum weitaus mehr anzogen als Orchestermusik. Durch das kontinuierliche Ausbalancieren zwischen alten und neuen Kompositionen, zwischen Vokal-und Instrumentalmusik, zwischen franzosischen und nichtfranzosischen Komponisten, zwischen Unterhaltung undErziehung des Publikums entwickelte Colonne eine Reihe von unterschiedlichen Strategien, die Wachstum und Überleben seines Orchesters garantierten. Einige dieser Massnahmen übernahm er von Vorgängern; andere hingegen waren vollig neuartig. Aber keine dieser Strategien wirkte auf Dauer. Selbst die Popularität von Berlioz in den 1870er Jahren oder die Wagners in den 1880er und 1890er Jahren bot keine vollständige Garantie fur Publikumsresonanz. Colonnes Strategien offenbaren nicht nur den dauernden Wandel des Publikumsgeschmacks, sondern auch die Grenzen seiner eigenen Bereitschaft, diesem Wandel und seinen wechselnden musikalischen und politischen Agenden zu entsprechen. Die Untersuchung des Verhältnisses zwischen der Produktion des Orchesters und der Aufnahme durch das Publikum dokumentiert den beständigen Wandel des damaligen Musikmarktes. Colonnes flexible Reaktionen auf diese Veranderungen waren die Voraussetzungenfur seinen bleibenden Erfolg. 1 I am grateful to M. Guy Arnaud and his staff for permission to consult the archives of the Concerts Colonne throughout summer 1993 and 1994. This study comes from a chapter in my forthcoming book: Useful Music, or Why Music Mattered in Third Republic France, Berkeley, University of California Press. 2 Hartmann was particularly interested in promoting Massenet, who did not appear on the programmes of the Société des Concerts until 1875. 3 This is still true today, as Allmendinger, J., J.R. Hackman and E.V. Lehman suggest in their article, 1996, “Life and Work in Symphony Orchestras”, Musical Quarterly 80, 2: 213. 4 In his chapter, “The classical repertory in Nineteenth-Century Orchestral Concerts”, in: Peyser, J. (ed. ), The Orchestra. New York; William Weber points out that most 19th-century orchestra concerts never programmed two pieces of the same genre back to back. Most started with a symphony or overture and included vocal music. 5 Composers were evidently free to increase the odds of a performance. During their first season, for example, the Vicomtesse de Grandval offered to pay the soloist fees if they would perform one of her works. According to William Weber, this practice of doing “trial” readings of composers’ works was begun as early as the late 1810s by the London Philharmonic Society and was embraced by most major orchestras by 1850. 6 In her chapter in this volume, I. Allihn points out that the Concerts Spirituels also did this in Berlin in the late 18th century. 7 The men on the initial list included the music publisher Auguste Durand, the composers Dubois, Diémer, Duparc, Fauré, Guiraud, d’Indy, Lalo, Lefebvre and Saint-Saëns, and the music critic Fourcaud. Bruneau, Duvernoy, Franck, Guilmant, E. Lemoine, Lenepveu, and the Prince Edmond de Polignac joined the following month, Bizet in December, Delibes, Alexandre (the organ-maker), and Charles de Beriot the next February, and Chabrier, Gallimard, Edouard Schure, and Hillemacher by December 1876. 8 The women on the initial list included Mme Erard, who had contributed 6000 fr, to help with Hartmann’s “Concerts Nationals”, the composers, Vicomtesse de Grandval and Augusta Holmès, as well as the performers, Pauline Viardot and Hortense Parent. The singer and patronness, Henriette Fuchs and the Baronne Nathaniel de Rothschild, joined in November 1874, Mmes Erard, Dreyfus, the Princesse Mathilde in February, and the Princesse de Bibesco, by December 1876. The Comtesse de Chambrun, among the initial members, once wrote to the orchestra asking to borrow scores for performances at her own salon. 9 Something similar was also printed on the Pasdeloup and Lamoureux programmes. Simon McVeigh noted that such efforts to control audience behaviour were also made in 18th-century England. 10 This was true each year for decades, an exception being that of 27 March 1891 at which three premieres were presented, earning half the norm for concerts of this period. 11 Malou Haine has noted that few orchestras in the middle of the century counted on high ticket sales the day of the concert. 12 During his 1875-76 season, Colonne premiered works by Saint-Saëns, Lacombe, Ritter, Schumann, Diémer, Coquard, Lalo, Maupeou, Duvernoy, Salvayre, de Grandval, Cahen, and Salomon. 13 This success was such that the Société des Concerts performed Arlésienne the following year, the first time Bizet appeared on its programmes. 14 Reyer, E. 1875, “Revue musicale”, Journal des débats, 12 December. The Société des Concerts had done Part Three in 1873 and 1876, but all of Roméo only later in January 1879. 15 These were the Air de Mephistopheles, the Ballet des sylphes, and the double chorus for students and soldiers. 16 By the third performance, major articles were written about Berlioz’ work by Morel, A. 1877, in Le ménestrel 4 March: 108f. 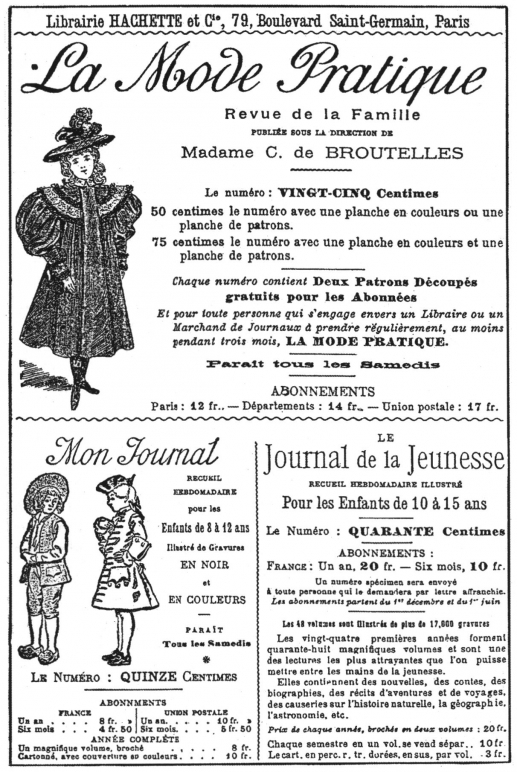 and Reyer, E. 1877, in Journal des Débats, 13 March, both to educate the public on its history and original reception. 17 Noel, E. and E. Stoullig 1878 [for 1877], Les annates du théâtre et de la musique. Paris, Charpentier: 588. After this point, critics tended to find “numerous imperfections” in Pasdeloup’s performances as compared to those of Colonne’s orchestra. 18 Simon McVeigh has pointed out that similar tactics were used by Paganini in his London concerts decades earlier. 20 While the first performances of Roméo earned 5,141 fr, the next two, in spring 1879, earned 3,831 and 3,155 fr. 22 At the Concerts Colonne, Mme Krauss often performed Cluck’s Divinités du Styx, Gounod’s Stances de Sappho, and Schubert’s Le roi des Aulnes, orchestrated by Berlioz. 23 On 19 December 1886, for example, Faure gave the premiere of Godard’s Symphonie légendaire, and on 8 April 1887 Mme Krauss sang the first performance of Charles Lenepveu’s Velléda. These concerts did well – grossing over 10,000 each, but not more. 24 Holmès’ Irlande also did relatively well the following year on 2 November, the concert earning 6,840 fr. Her Au pays bleu, which they premiered on 8 March 1891, earned less, 4,092 fr, but Colonne found it good enough to repeat two more times that season. 26 Charles Malherbe, “Les Concerts de l’Association Artistique”, Programme notes of Concerts Colonne, 17 October 1897. Although in 1892 he had programmed in chronological order the four Schumann symphonies and in 1895-96, the nine Beethoven symphonies, this was the first time Colonne conceived of an entire concert season as an opportunity to present works in some “rational and instructive way”. PASLER, Jann. Building a public for orchestral music : Les Concerts Colonne In : Le concert et son public : Mutations de la vie musicale en Europe de 1780 à 1914 (France, Allemagne, Angleterre) [en ligne]. Paris : Éditions de la Maison des sciences de l’homme, 2002 (généré le 19 avril 2019). Disponible sur Internet : <http://books.openedition.org/editionsmsh/6774>. ISBN : 9782735118168. DOI : 10.4000/books.editionsmsh.6774. Pasler, Jann. “Building a public for orchestral music : Les Concerts Colonne”. Bödeker, Hans Erich, et al.. Le concert et son public : Mutations de la vie musicale en Europe de 1780 à 1914 (France, Allemagne, Angleterre). Paris : Éditions de la Maison des sciences de l’homme, 2002. (pp. 209-240) Web. <http://books.openedition.org/editionsmsh/6774>. BÖDEKER, Hans Erich (dir.) ; WERNER, Michael (dir.) ; et VEIT, Patrice (dir.). 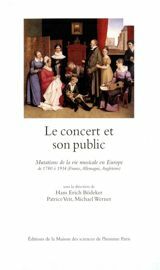 Le concert et son public : Mutations de la vie musicale en Europe de 1780 à 1914 (France, Allemagne, Angleterre). Nouvelle édition [en ligne]. Paris : Éditions de la Maison des sciences de l’homme, 2002 (généré le 19 avril 2019). Disponible sur Internet : <http://books.openedition.org/editionsmsh/6740>. ISBN : 9782735118168. DOI : 10.4000/books.editionsmsh.6740. Bödeker, Hans Erich, et al., ed. Le concert et son public : Mutations de la vie musicale en Europe de 1780 à 1914 (France, Allemagne, Angleterre). Paris : Éditions de la Maison des sciences de l’homme, 2002. Web. <http://books.openedition.org/editionsmsh/6740>.